I admit – this wasn’t my original intention. For my next Hall Of Fame induction I was planning to introduce an athlete in a sport which is not track & field – because despite the evidence for the contrary, this is not a track & field Hall Of Fame. It embraces all sports without considering their race, age, religion, sexual orientation, etc. But Borzakovskiy just recently announced his retirement from the world of sports, and I decided to make a change of plans. Yuriy was one of my all-time favorite track & field athletes, and his place in the Hall Of Fame was guaranteed, but I used this opportunity to honor him and induct him now instead of sometime later. 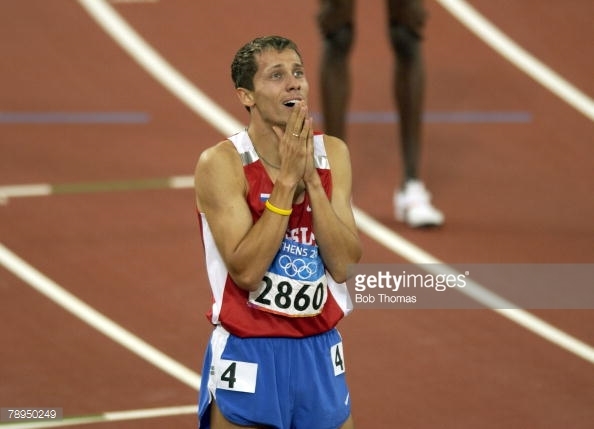 This entry was posted in Hall Of Fame, Track & Field and tagged 800m, Athens 2004, Athletics, Track & Field, Yuriy Borzakovskiy on February 26, 2015 by michaelbrus25. It’s been a while since our first induction to the Blog’s Hall of Fame, so it is time we introduce our second inductee. And this time it’s Israel’s greatest track & field athlete of all-time, one of the greatest pole vaulters of the last 15 years, Aleksandr (or Alex) Averbukh. This entry was posted in Hall Of Fame, Track & Field and tagged Aleksandr Averbukh, Athletics, European Athletics Championships, Pole Vault, Track & Field, World Championships in Athletics on January 9, 2015 by michaelbrus25. Our first inductee to the Blog’s Hall Of Fame is… drum roll please… Kajsa Bergqvist! This entry was posted in Hall Of Fame, Track & Field and tagged Athletics, Helsinki 2005, High Jump, Kajsa Bergqvist, Track & Field, World Championships in Athletics on November 20, 2014 by michaelbrus25.